David Beckham and His Kids Sit Front Row At Victoria's Show in NYC! 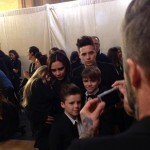 Home » David Beckham and His Kids Sit Front Row At Victoria’s Show in NYC! David Beckham and His Kids Sit Front Row At Victoria’s Show in NYC! David Beckham was photographed sitting front row at his wife Victoria’s fashion show with kids Brooklyn, Cruz, Romeo and Harper on Sunday, February 15th, 2015. Always in the front row at his wife’s fashion shows, the football star is often accompanied by one of his children. Today, was the first time the whole family has been on hand to support Victoria! 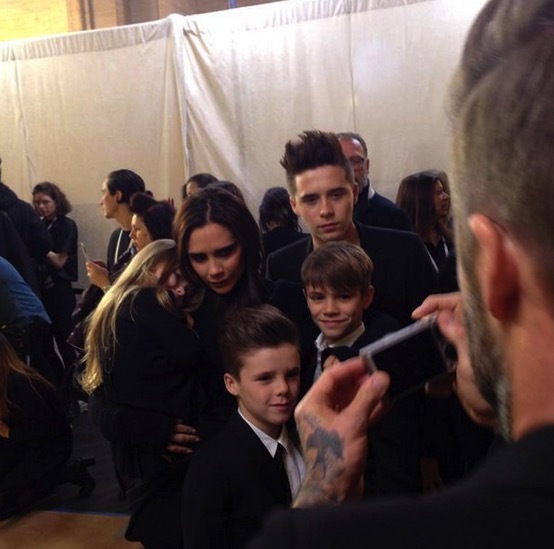 The Telegraph posted a photo of David taking a picture of Victoria backstage surrounded by her 4 children. The day before David was photographed arriving at JFK with his crew. How cute does Harper look with her fedora and navy pea jacket? The boys were dressed for the cold New York City weather in Winter jacket, gloves and tuques.